The 2016 Geneva Motor Show in March saw Renault take the wraps off the All-New Scénic, a striking, compact MPV with pioneering proportions and, in an unprecedented move, 20-inch wheels as the standard fitment across the range. It is now the turn of the new Grand Scénic to break cover and extend the Scénic line-up. Chrome or Metal Grey accessories, sculpted forms and body sides, and a distinctive belt line towards the rear which combine to produce a fluid, elegant silhouette. For the first time in the segment, 20-inch wheels are standard, while a two-tone livery and harmonious interior trim underline the model’s modern personality. Cabin modularity and travelling comfort – which are two strengths that have helped to forge the Scénic’s reputation – have been thought through to ensure that the needs of families are met even more closely. A One Touch Folding Seat function allows the rear seats to be folded automatically to obtain a flat floor and facilitate loading. Meanwhile, the new Grand Scénic is 24cm longer than the new Scénic and consequently boasts extra boot space and carrying capacity compared with its sibling: 718dm3 VDA (five-seat version) for an extra 222dm3 VDA compared with the new Scénic. The new Grand Scénic comes with a comprehensive suite of driver aids too, including Active Emergency Braking (AEBS) with Pedestrian Detection as standard equipment for the first time in the segment. The list continues with technologies from the next segment up, such as Multisense experience, a R-Link 2 multimedia tablet complete with a large 8.7-inch display and a full-colour head-up display. Last but by no means least, the fourth generation of the model can be specified with Renault’s Hybrid Assist electrified diesel engine. 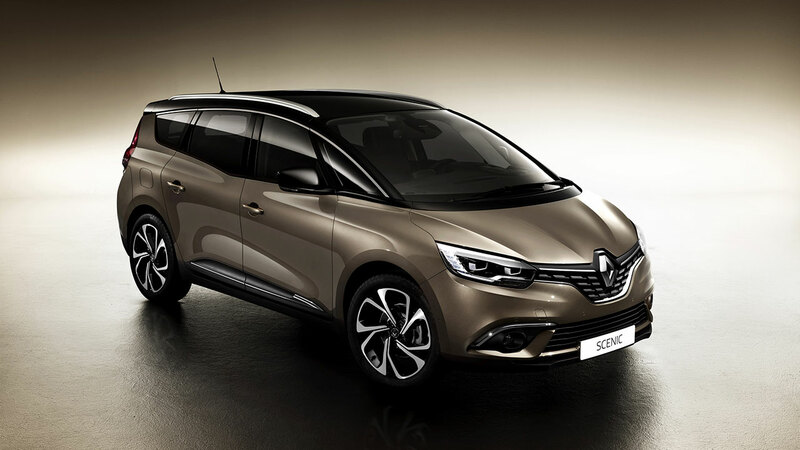 The All-New Scénic and All-New Grand Scénic (five or seven seats) will be available for sale before the end of the year 2016. A longer wheelbase and shorter rear overhang compared with the previous generation version. Elegantly sculpted sides plus a distinctive belt line towards the rear. The vertical form of the new Grand Scénic permanently-lit 3D-effect rear lights stands out from the new Scénic’s ‘horizontal’ rear light cluster. A fixed, panoramic glass roof with no cross-member for an even brighter cabin. Fitted as standard from the second equipment level up, the new Grand Scénic’s practical matt-finish aluminium roof bars add refinement and status. A Metal Grey diffuser incorporated in the rear bumper skirt. A two-tone livery is available from the second equipment level up, either as an option or a standard feature of higher-end versions (depending on market). The colour of the door mirror housings and windscreen pillars is coordinated with that of the roof (Black or Grey). The launch colour – Vision Brown – is specific to the new Grand Scénic. Probably the most groundbreaking feature of the new Scénic’s design is the fitment of 20-inch wheels as standard across the range. These narrower wheels (195mm) are both a technological and styling innovation. With a sidewall height of 107mm – equivalent to that of the Scénic 3’s 17-inch tyres – the new Scénic’s tyres ensure a level of ride comfort that is amongst the market’s very best. This bold design choice was a key guiding principle behind the project from the start. Indeed, these large wheels make an active contribution to the car’s balanced proportions and are customisable on demand thanks to a comprehensive choice of rims and inserts, called ‘add-ons’. These rims and add-ons have also been devised to save weight and streamline the car’s aerodynamics, which leads to lower fuel consumption. The unique size of these wheels (195/55 R20), and the fitment of specifically developed tyres for lower energy consumption and enhanced aerodynamic efficiency, also guarantee class-leading rolling resistance. When the centre console is in the forward position, it tucks beneath the large portrait-format display to form a single unit, creating a saloon-car cockpit feel for the driver who still benefits from the high-up seating position associated with MPVs. With the console in its rearmost position, the new Grand Scénic boasts a more ‘open plan’ arrangement that can be shared between the driver and the car’s other occupants. Higher-end versions feature a Club Brown interior trim (upper part of the dashboard, front door trim) for a warm, refined ambience. The new Grand Scénic can be specified with either five or seven seats, with all passengers benefiting from the same careful attention to travelling comfort that has forged the Scénic’s reputation over the years. The occupant-friendly modular cabin features a long list ingenious solutions and equipment designed to meet the needs of modern families. 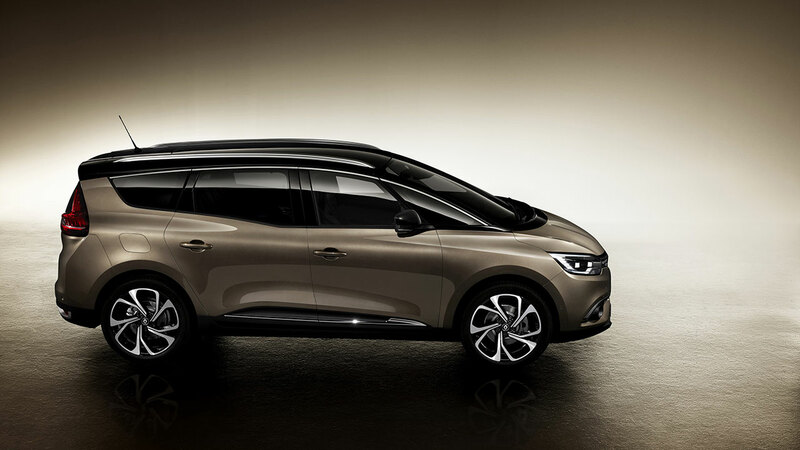 The structure of the front seats is similar to those of the new Espace. Eight-way power adjustment, including lumber adjustment, and heated seats are available for higher-end versions. Independently sliding 60/40-split second row seats for all versions. 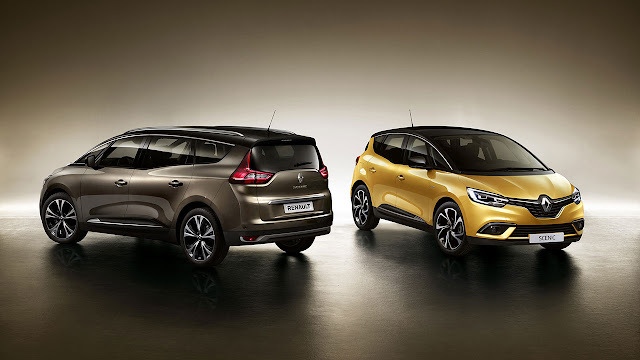 In the case of the seven-seat version, the design of the folding third row seats is similar to those of the new Espace. The One Touch Folding Seats function available for certain equipment levels enables the rear seats to fold automatically in order to obtain a flat floor and optimised carrying capacity with just one tap on the R-LINK 2 display or by using the control fitted in the boot. The Easy Life sliding centre console – a hallmark of the Scénic – has evolved in order to cover the new requirements of both front and rear passengers, providing up to 13 litres of storage capacity. The front part of the console offers a lit stowage area protected by a sliding cover, plus an integrated armrest, underneath which can be found two USB ports, an SD card slot, an audio jack socket and a 12-volt power supply (depending on equipment level). Rear passengers have access to two USB ports, an audio jack socket, a 12V socket and their own dedicated storage space. The new Grand Scénic, which is 24cm longer than the new Scénic, provides additional carrying capacity and a bigger boot in comparison with its sibling. With the rear seats in their rearmost position, the carrying capacity of the five-seat version is 718dm3 VDA (equivalent to 765 litres). 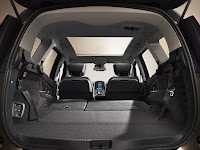 Total carrying capacity can be extended to 866dm3 VDA with the rear seats pushed fully forward. The new Grand Scénic also comes with a sliding luggage cover. 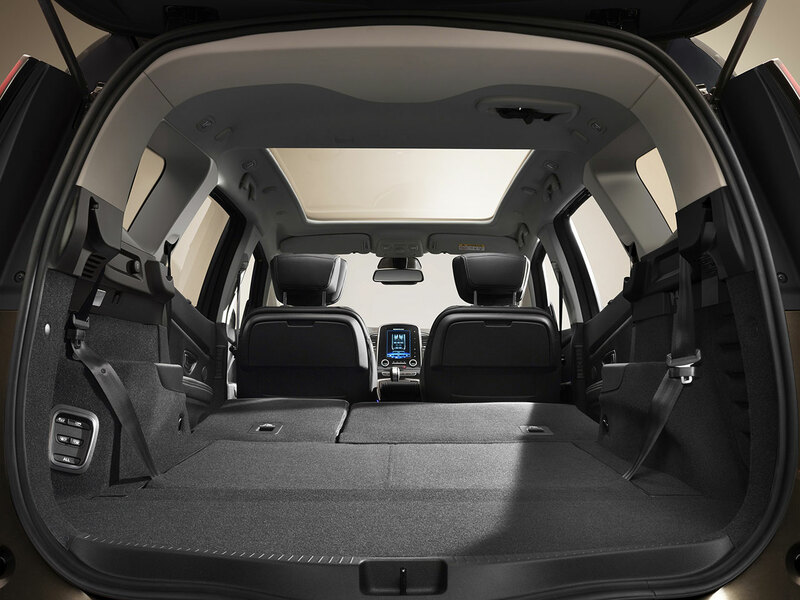 With a total additional stowage capacity of 63 litres, the new Grand Scénic stands out as the class leader in the long compact MPV segment. In addition to the Easy Life sliding centre console, the new Scénic boasts several other ingenious stowage solutions for an additional capacity of 38.5 litres. This is achieved notably by retaining the four underfloor compartments that have always been particularly appreciated by families. In the back, the new Grand Scénic is equipped with Easy Life folding tables (standard or optional, depending on market) which are ideal for family use on longer journeys. In the deployed position, it is possible to attach electronic tablets of different sizes. When folded, there is a small storage area that can accommodate a mobile phone, a gaming console or perhaps crayons. The two USB ports at the rear of the sliding centre console mean electronic devices can be used without time restraints. The impressive array of family-focused equipment inside the new Grand Scénic continues with sunblinds for rear passengers, either as standard equipment or available as an option, depending on version. For the first time in the compact MPV segment, the new Grand Scénic – like the new Scénic – features Active Emergency Braking (AEBS) with Pedestrian Detection as standard equipment. This driving aid functions across a speed range of 5mph to 37mph (7kph to 60kph) and is complementary to conventional Active Emergency Braking (AEBS City and Inter-Urban). Lane Keeping Assist (LKA): this feature works at speeds between 44 and 100mph (70 and 160kph) and adjusts the steering to keep the Grand Scénic in the correct lane if it senses that the vehicle is drifting. The system also warns the driver if he or she leaves the lane (Lane Departure Warning, LDW) by causing the steering wheel to vibrate. Fatigue detection warning: at speeds in excess of 37mph (60kph), the vehicle’s line is permanently analysed. Should an anomaly be detected, visual and audible warnings are activated. Assist: Reversing camera; automatic dipped and main beam headlights (AHL); front, rear and side parking sensors; Easy Park Assist (hands-free parking). These driving aids are the building blocks for autonomous driving. The new Grand Scénic is available with a choice of five diesel powerplants – including an electrified Hybrid Assist engine – and two petrol engines (depending on market). Hybrid Assist, which comprises an electric generator and a 48-volt battery, recovers deceleration energy, thereby allowing the electric motor to assist the internal combustion engine. The benefit is more responsive performance and a lower fuel consumption. The new Scénic and Grand Scénic benefit from CMF C/D (Common Module Family) modular architecture and come with a wide range of features more generally associated with the next segment up, as seen on the new Espace and Talisman D-segment models. 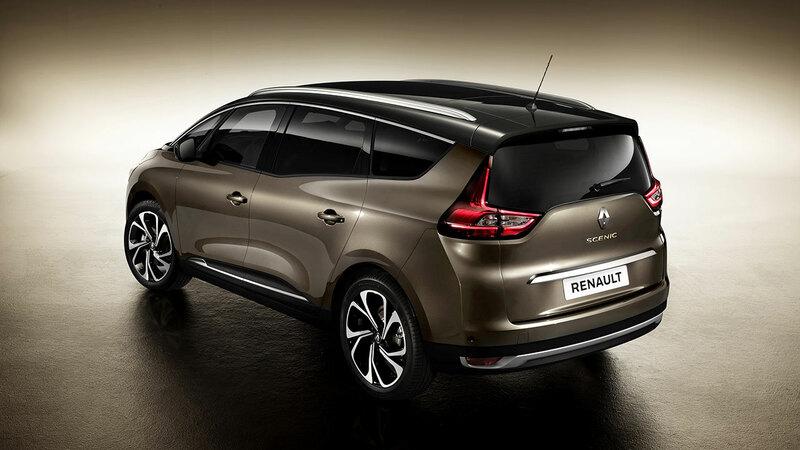 This version of the CMF platform has also been used on the All-New Mégane and All-New Kadjar. Higher-end versions of the new Grand Scénic are equipped with R-LINK 2 complete with an 8.7-inch (22cm) portrait-format display. Unique in the compact MPV segment, the system benefits from an easy-to-use capacitive ‘pinch & zoom’ screen, much like that of a smartphone or tablet computer. R-LINK 2 includes voice recognition for the navigation system, telephone use, apps and radio, ensuring easy access and safe operation of its various functions. Clear, intuitive graphics, similar to those employed by tablets and smartphones, complete with click and-drag to move icons, page scrolling, two-finger zoom, etc. Connectivity: a package that includes a free 12-month subscription to TomTom Traffic, access to the R-LINK Store’s catalogue of motoring-related apps and up-to-date European maps (depending on market). Multisense technology allows users to personalise their driving experience by modifying the response of the accelerator pedal and engine, adjusting the speed of the gearshifts performed by the EDC (Efficient Dual Clutch) automatic transmission and controlling the firmness of the steering and the cabin lighting environment. A Multisense button on the dashboard’s centre console provides direct access to five different driving settings which are displayed on the R-LINK 2 screen: Neutral, Sport, Comfort, Perso and Eco. This is complemented by a choice between five interior lighting ambiences: sepia, red, blue, purple and green. The selected ambience covers the centre console – as well as the front and rear door panels of high-end versions – and matches the colour of the dashboard’s TFT screen and portrait-format R-LINK 2 display. The retractable full-colour head-up display enhances driving comfort and safety by making the driving aids (ADAS) more legible and easier to use. Without the driver needing to take his or her eyes off the road, the screen displays all relevant information (current speed, navigation instructions, driving aids) to ensure a relaxed driving experience. 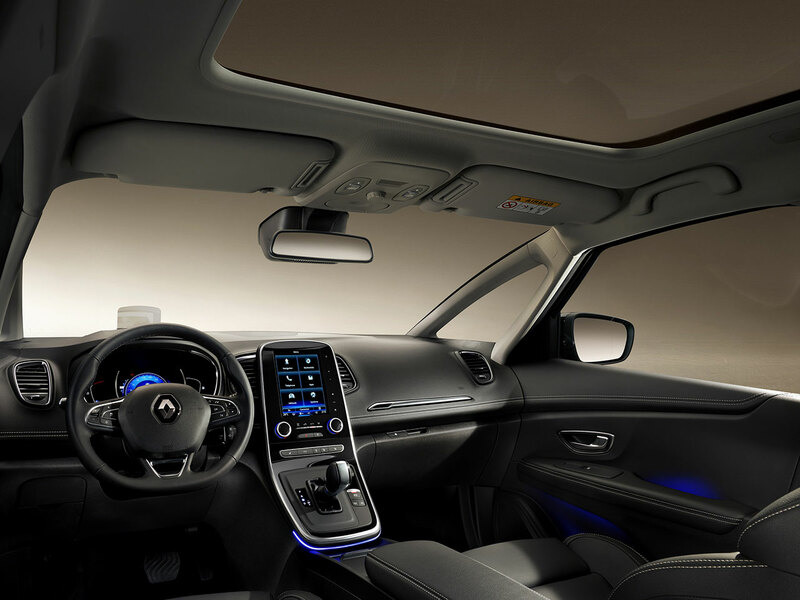 The new Scénic is available with BOSE® Surround Sound audio, an innovation initially seen only on Renault models from the next segment up. Once again, engineers from Renault and BOSE® collaborated closely to produce a tailor-engineered sound specifically configured for the new Grand Scénic thanks to the optimal positioning of thirteen high-powered loudspeakers: a central loudspeaker at the front to ensure well-balanced sound, ten high-performance loudspeakers spread around the cabin to generate clear, precise quality, and a subwoofer incorporating two speakers in the boot to reproduce music in all its original depth. This combination allows all occupants of the vehicle to enjoy an exceptional, immersive audio experience.